“You’re no more a mess than anyone else,” he said in a low voice. Oh wow- this book was everything, absolutely everything. We loved every single minute reading Jonah and Kacey’s story and Emma Scott grabbed our heart and soul with her words. It was perfection- such beauty and heartbreak. Such tender and sweet moments. This is the kind of intense romance we know we’ll never forget, it hit us right into the depths of our hearts. The impact of what we read, the message of life and what it is to truly live and what is ultimately important. Well it’s all there. Love, inspiration, friendship and hope. Sorrow, grief and tragedy. All part and parcel of life. All written flawlessly with such realistic passion. Emma Scott gave us her all. A love of a lifetime. Everything felt so incredibly real and the beauty of the characters had us riveted. We first meet rock chick musician, Kacey who’s a singer songwriter and a member of a band just about to hit it big. Her life’s not been easy and she’s lived a cold and affection-less childhood. This girl is starved of caring human contact and craves someone – anything – real in her life. Her life is empty of what she truly needs yet filled with everything set to destroy her. Until Jonah. The man with a plan. Jonah was everything- oh how we fell in love with this boy. A loving brother, a gifted artist and a friend. Jonah is as beautiful on the inside as he is on the outside, caring for everyone around him and offering help and support to Kacey – a stranger in need – when he picks her up on one of the nights working as a limo driver. Jonah was as quick witted as Kacey making their banter a much needed and humorous reprieve. When you feel trapped, lost or scared and someone holds out their hand and says I’ve got you, come with me. When you feel their warmth, their support and their love – you grab that hand and hold on tight. Kacey and Jonah – night and day. In theory it shouldn’t work but oh wow be still our hearts because it completely worked. These two brought the best out of each other and gave to each other what was ultimately needed- all the while two halves became a whole. Two souls entwined. Like glass, fragile and breakable by life’s obstacles yet strong and hardened by actual life itself. As we read we marvelled at Emma Scott’s ability to write a story where we truly felt every important moment, where we followed the characters at a steady yet intense pace. Where no character was compromised nor made a victim to the storyline development. It quite simply worked beautifully, expressively and passionately. 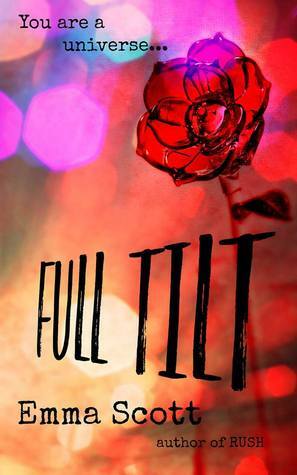 Whilst this is part one of a duet there’s no cliff-hanger and Full Tilt can be read as a standalone. We do not want to spoil this poignant read so all we’ll say is READ this book, you will not regret it. Beautiful review! I’ve been saving this one to read on Saturday, I know it’s going to comsume me! I just adore Emma.